The classic Alfred Hitchcock thriller “North by Northwest” contains a few of Hollywood’s most memorable–and ludicrous–sequences, including a famous scene in which our hero, played by Cary Grant, finds himself being shot at by a crop duster at a bus stop near a cornfield. In the spirit of the seemingly preposterous, consider a path to reelection for President Obama that is less North by Northwest than South by Southwest, to borrow from the music and film festival held in Austin each year. A South by Southwest map plots a course to an Obama victory that follows in the footsteps of the Americans and immigrants who are voting with their feet, choosing to live in the West and the South rather than in the Midwest. It also reads the fluttering tea leaves that indicate the Obama campaign is pondering a non-traditional electoral map. The Obama campaign, to be sure, is not going to give up on the Midwest, and it should have the resources to compete for electoral votes across the country. But a South by Southwest focus might affect the president’s reelection message and, in an exceedingly close race, help determine which states the Obama campaign targets with presidential visits, ground game resources and advertising. Hypothetically, there is a way that Obama could lose most of the Midwest and still be reelected. What would his map look like? 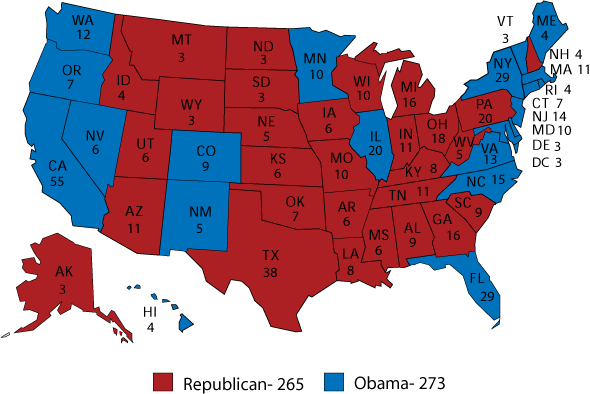 Let’s start with two assumptions, the first based on the Crystal Ball’s initial Electoral College map for 2012 above. Obama, if you count up the “safe” and “likely” states in each side’s column, begins this campaign with 196 electoral votes to 170 for his as-yet-unnamed Republican opponent. To win 270 electoral votes and a second term, Obama therefore needs to find a minimum of 74 more electoral votes. The South by Southwest path to victory also assumes that Obama is so damaged in the Midwest that he loses Michigan, Indiana, Ohio, Wisconsin, Iowa and Pennsylvania (a Midwestern state for the purposes of this article), states he won in 2008. Notably, Michigan, Pennsylvania and Wisconsin are all states that Democrats have carried in each of the past five presidential contests (six for Wisconsin). Under this map, Obama loses all Midwestern states save two: Minnesota, the only state in the union to support the Democratic nominee for president in every election since 1976 (thanks to its sole support of home state candidate Walter Mondale in 1984); and Illinois, Obama’s home state. Assuming such heavy losses for Obama in the Midwest is quite a stretch at this point, but consider that those six states held a combined 10 gubernatorial and U.S. Senate races in 2010. Republicans won every one. This scenario also assumes that Obama loses a seventh state, New Hampshire, that he won in 2008. In such a wipeout, Obama nonetheless could still win if he looked to the South and to the Southwest. Obama would obviously have to hold on to Virginia and North Carolina, two states he won in 2008 that had supported Republican presidential candidates in nearly every presidential race the previous four decades. Obama is clearly paying a lot of attention to these two states: twisting the arm of his party chairman, Tim Kaine, to run for the Senate in Virginia and, as mentioned above, holding his 2012 re-nomination convention in Charlotte. Looking to the Southwest, Obama also would need to win Colorado, New Mexico and Nevada, which all are trending blue states where he performed better in 2008 than he did in some other notable swing states, such as Ohio and Virginia. Obama’s “likely” and “solid” states, combined with North Carolina, Virginia, Nevada, Colorado and New Mexico, get him to 244 electoral votes. At that point, his path to 270 can go two different ways. The first would be to win two of the three Midwestern states that, as mentioned, Democrats have won in at least the past five presidential elections: Wisconsin, Michigan or Pennsylvania. The second, in keeping with the South by Southwest theme, would be to win swing state Florida, now tied with Democratic New York as the third-biggest Electoral College vote haul (29) in the country (behind Democratic California and Republican Texas). Adding Florida to the aforementioned states – again, a map in which the entire Midwest save Illinois and Minnesota is red – Obama gets to 273 electoral votes and a second term. This is by no means a prediction, and if history is a guide, it is not even much of a possibility. After all, the last candidate to win a presidential election without a single electoral vote from Ohio, Michigan or Pennsylvania was Grover Cleveland more than a century ago (1884). But the country is changing, perhaps for the better for Democrats. By just one measure, the six states emphasized here as potentially remaining in Obama’s column (CO, FL, NC, NM, NV and VA) are an average of 22% Hispanic, ranging from Virginia and North Carolina (roughly 8%) to New Mexico (46%). On the other hand, six states taken from Obama’s column (IA, IN, MI, OH, PA and WI) are just an average of 5% Hispanic, ranging from 3% in Ohio to 6% in Indiana, all according to 2010 census figures. Obama took two-thirds of the Hispanic vote in 2008. Democrats can see, on the horizon, a coalition of minorities, highly educated voters and young people making up a durable model for dominating presidential elections–in other words, Sen. Bennet’s Colorado coalition from last year, as described above. This is a coalition that in the long run could favor them in not just the “South by Southwest” states, but also Texas, Georgia and Arizona, three red states that the Obama campaign is reportedly considering targeting next year. While it is intriguing to think about this South by Southwest electoral map delivering a weakened Obama a narrow win in 2012, it is a possibility that, like a crop duster shooting at a man in a movie, doesn’t quite translate to real life.